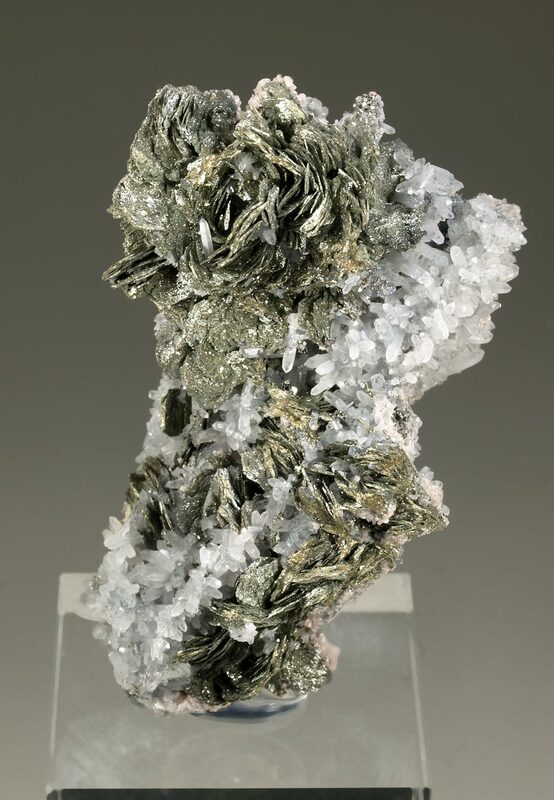 Brilliant specimen showing a very well defined crystals of arsenopyrite covering the matrix, some of them with good size. 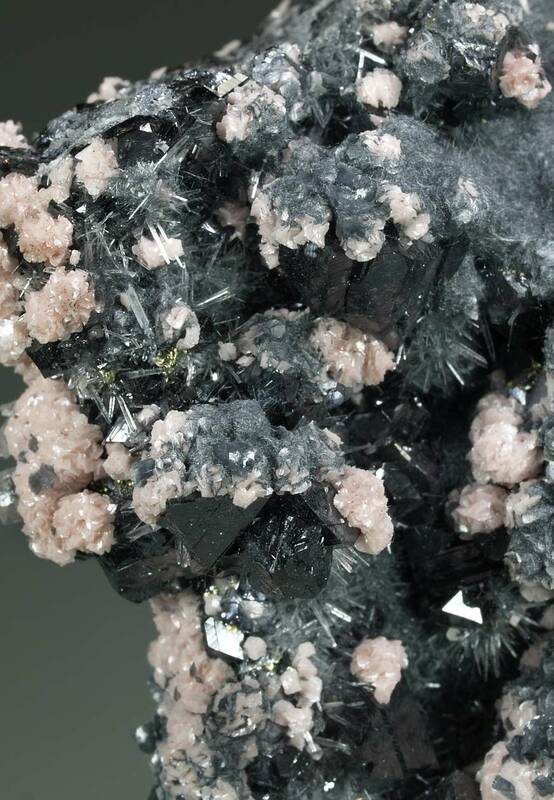 They are accompanied by brilliant quartz crystals, pinkish calcite due to the content of Mn and small groups of boulangerite needles. 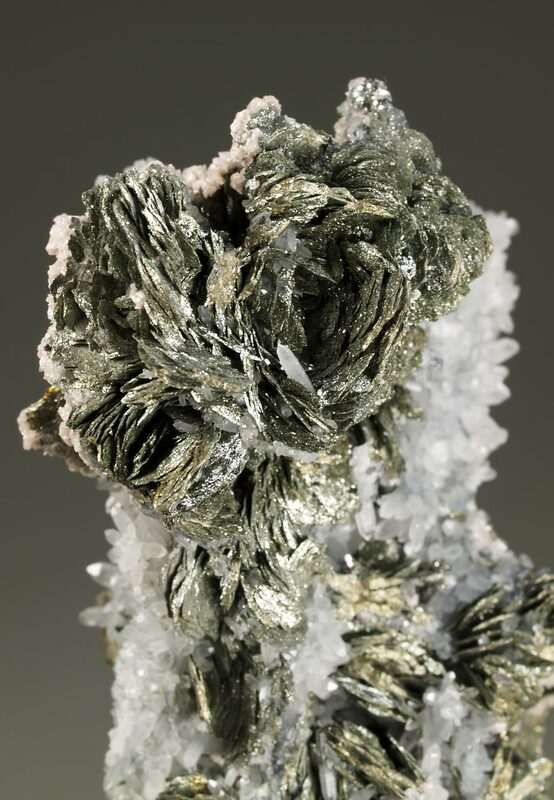 A very luminous specimen. 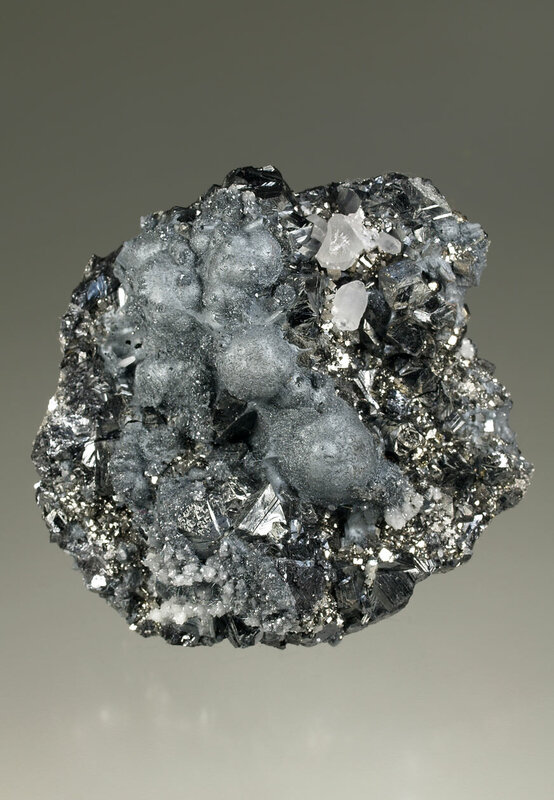 Size: 8.3 x 6.8 x 5.2 cm. 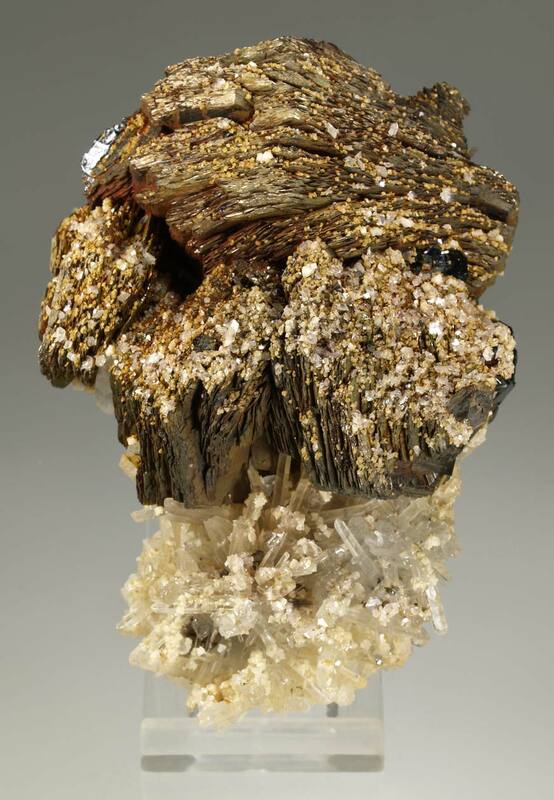 Specimen with a good size from this classic Kosovar mine. 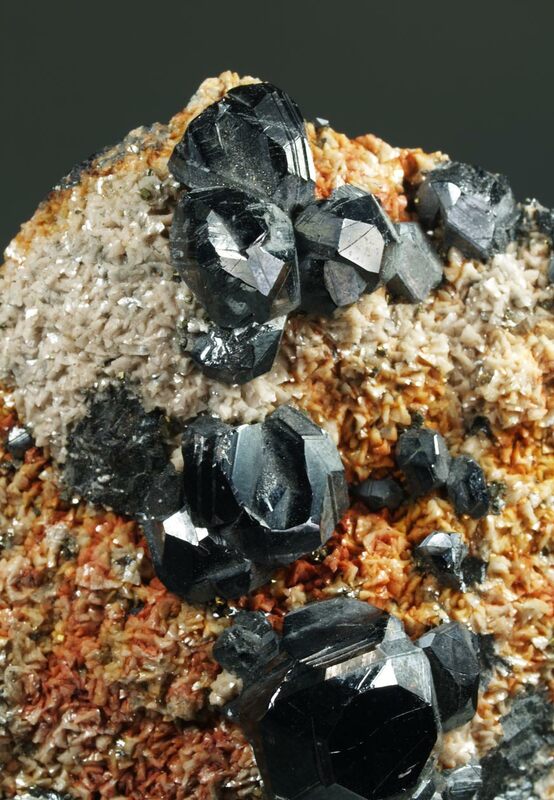 A matrix formed by crystals of arsenopyrite, twinned sphalerite, pyrite and some quartz. 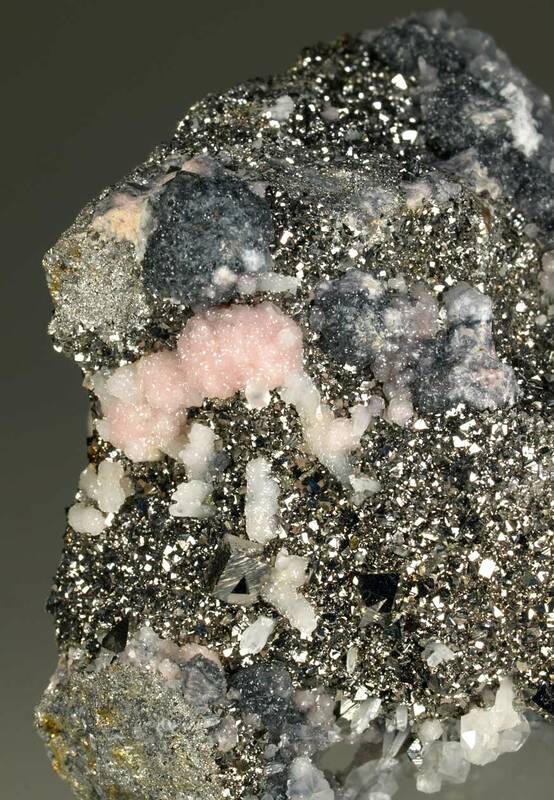 On them have grown nice aggregates of boulangerite showing a metallic gray fine-acicular crystals, but may have other sulphides of the same group, which are called plumosite. 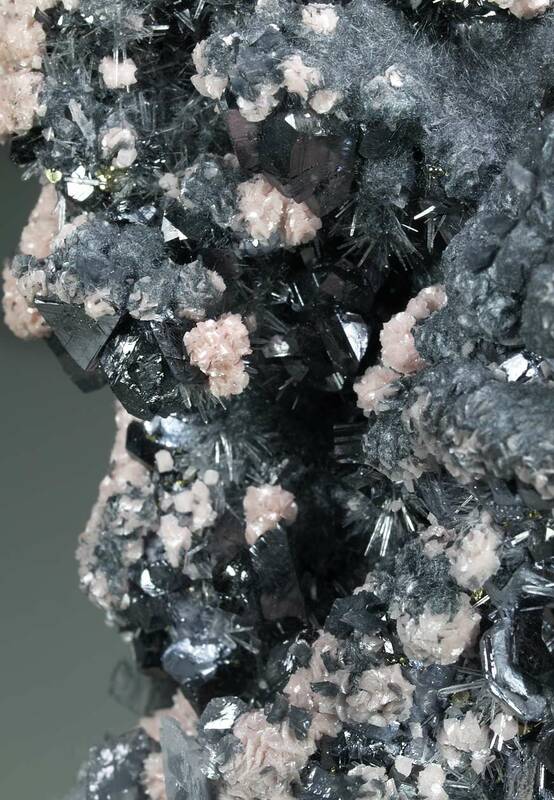 A very brilliant and aesthetic specimen. Size: 8.5 x 7.8 x 5.2 cm. 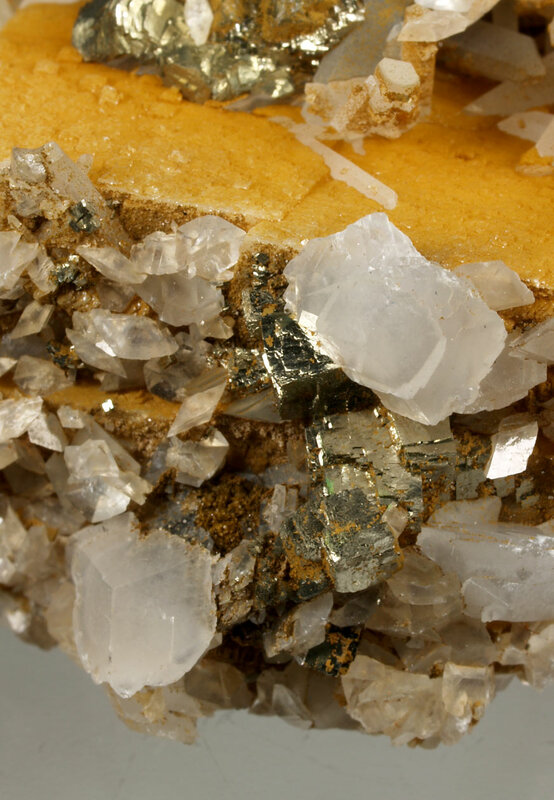 Main crystal: 22 mm. 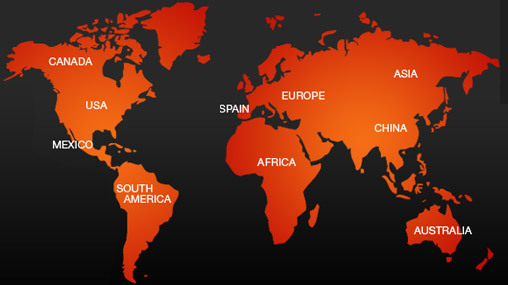 glob. aggr. A very aesthtic combo of several species. 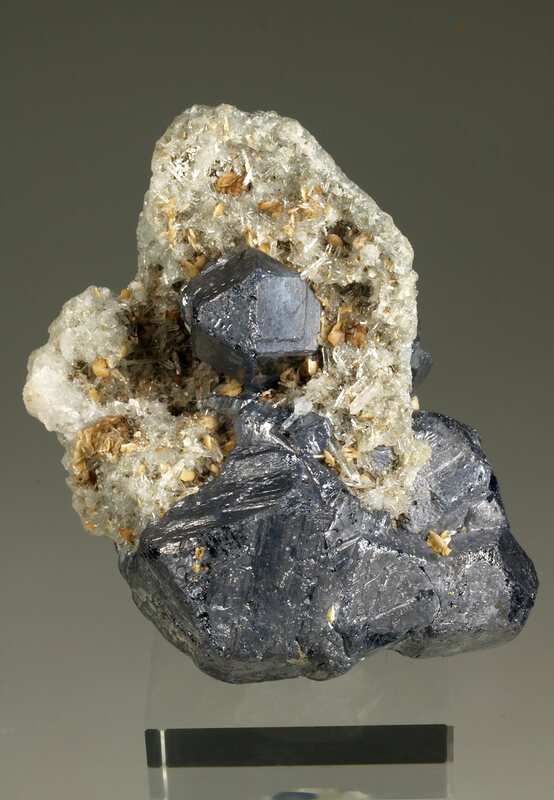 On a matrix formed by two rhombohedral calcite crystals different sized aggregates of pyrite cubes, bright and sharp, with galena showing the spinel twinn. 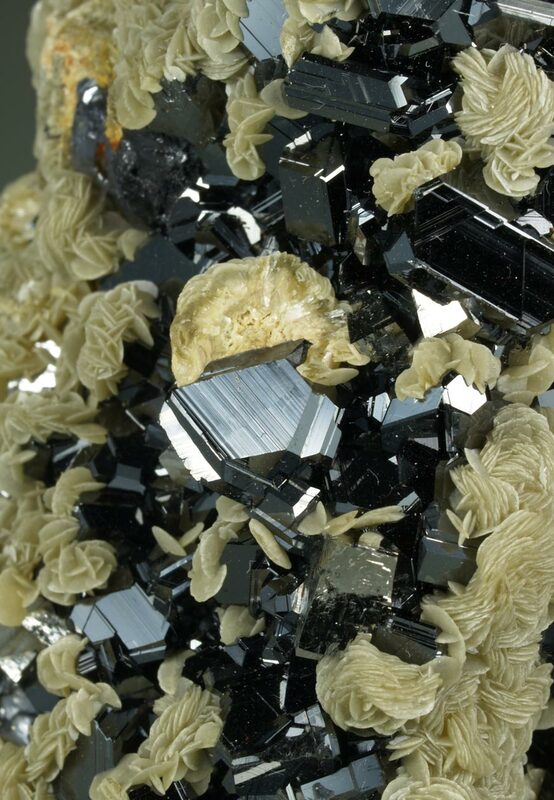 They are accompanied by a second generation of rombohedral and lenticular calcite crystals, pyrrhotite and quartz. 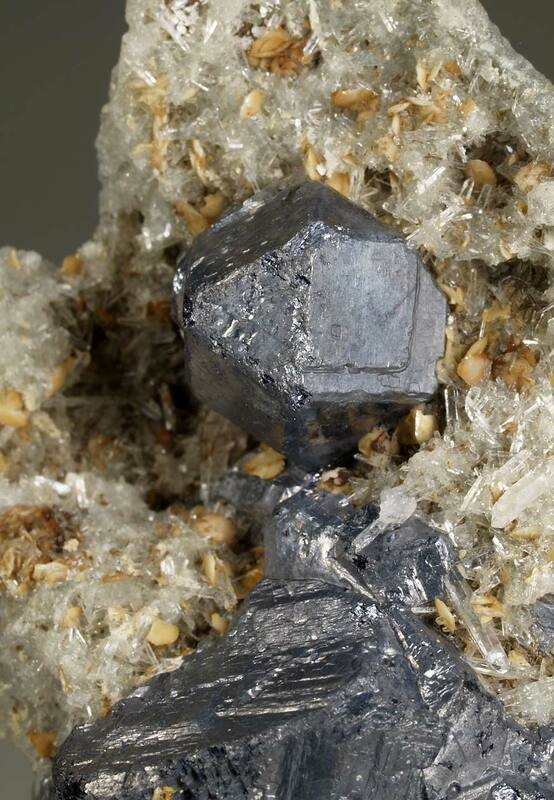 A brilliant specimen from this classic European mine. Size: 7.8 x 6.7 x 4.5 cm. 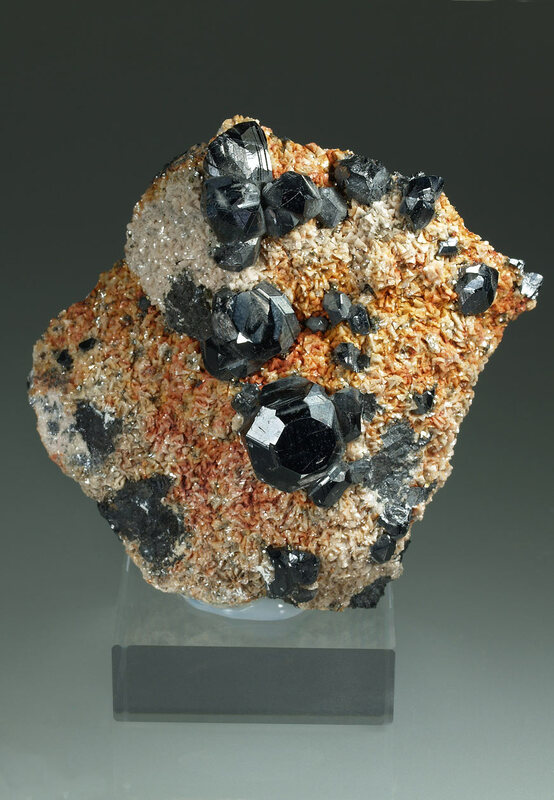 Excellent group of sphalerite crystals, twinned and with complex forms. 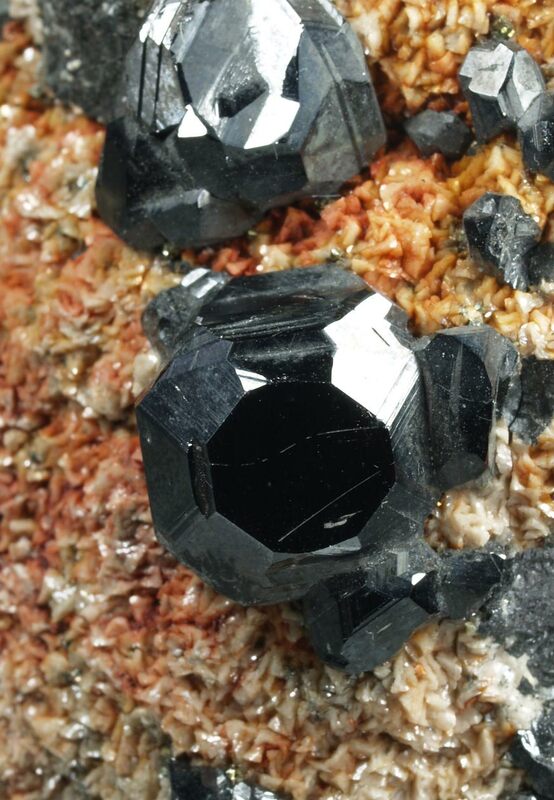 With good brilliance and intense black color. 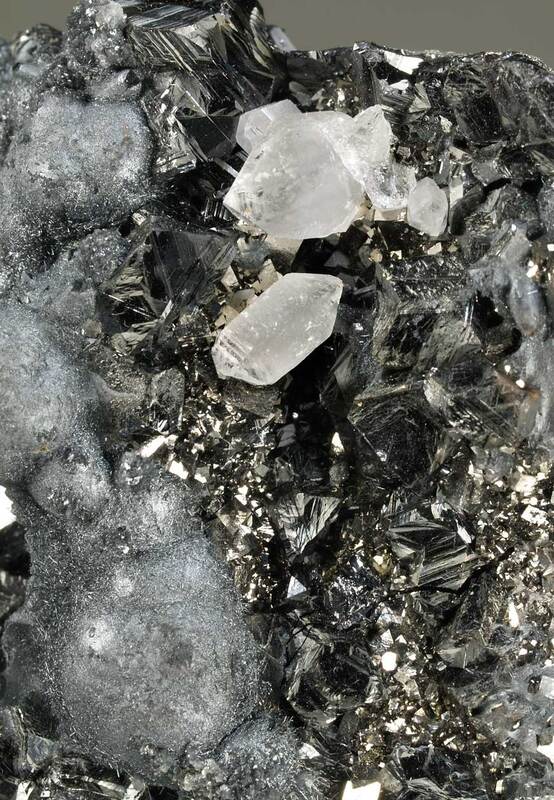 Highlights one of these crystals that shows us a large number of faces, with cube, trapezohedron, tetrahedron forms... A true crystallographic gem, not easy to find. 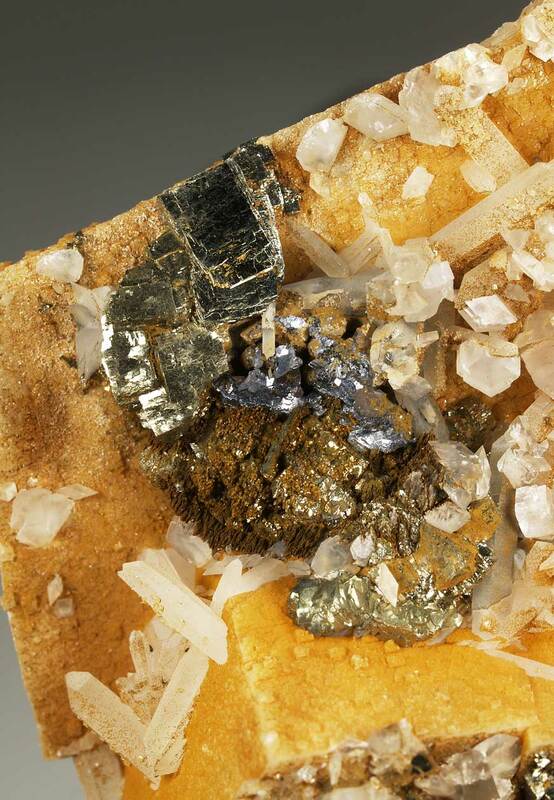 With a matrix of brilliant dolomite crystals and some arsenopyrite. Size: 7.5 x 7.0 x 3.8 cm. 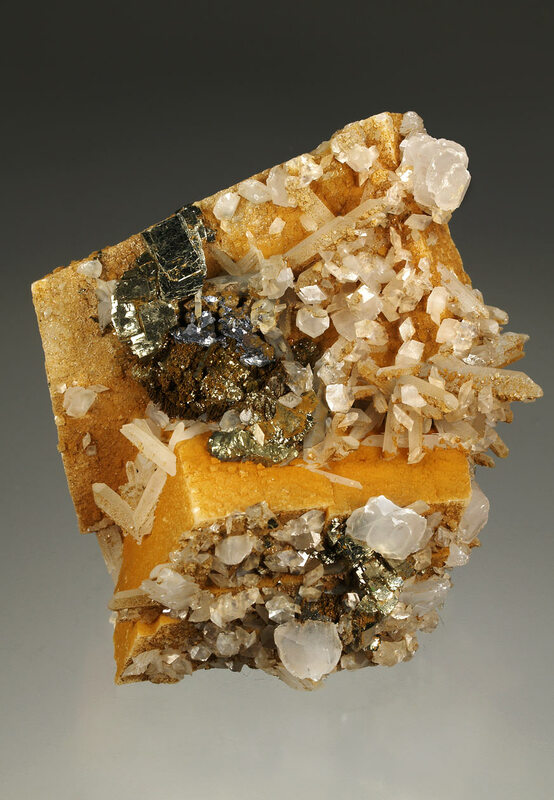 Group of crystals of pyrrhotite completely replaced by brilliant pyrite crystals, which perfectly preserve the hexagonal shape of the original species. 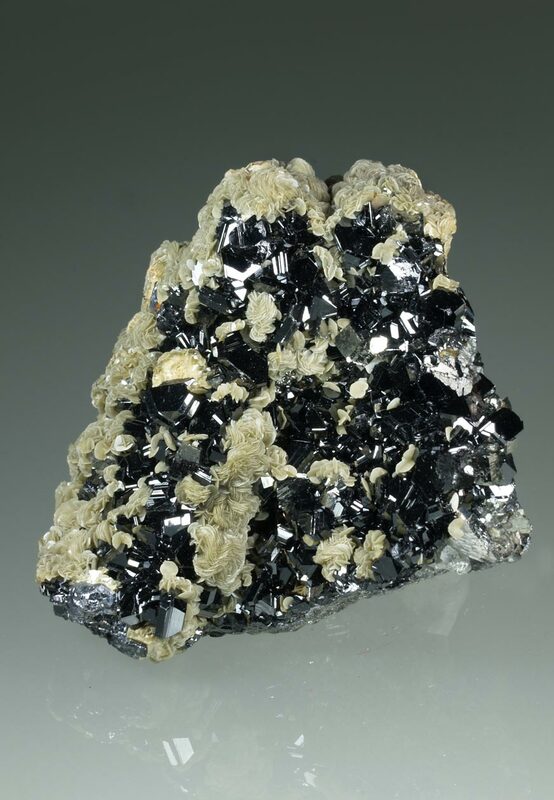 It is accompanied by groups of sphalerite crystals, very sharp, intense black color and good luster, with complex forms and twins. 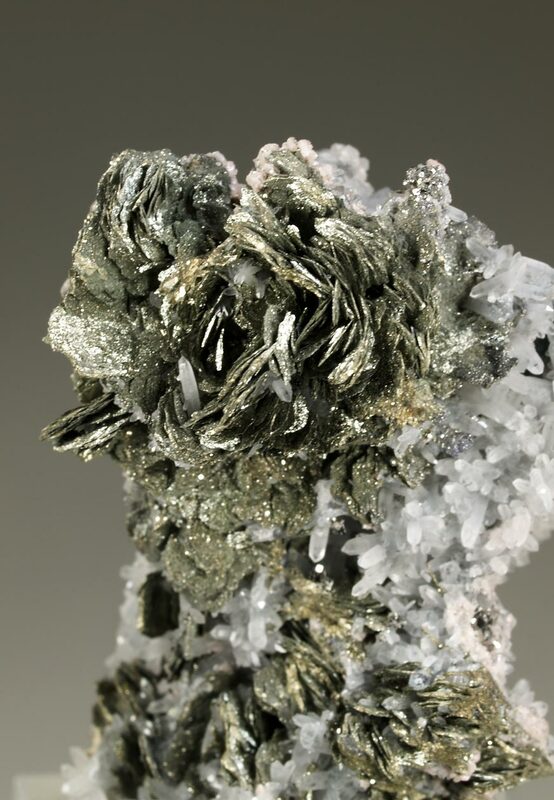 With some arsenopyrite. 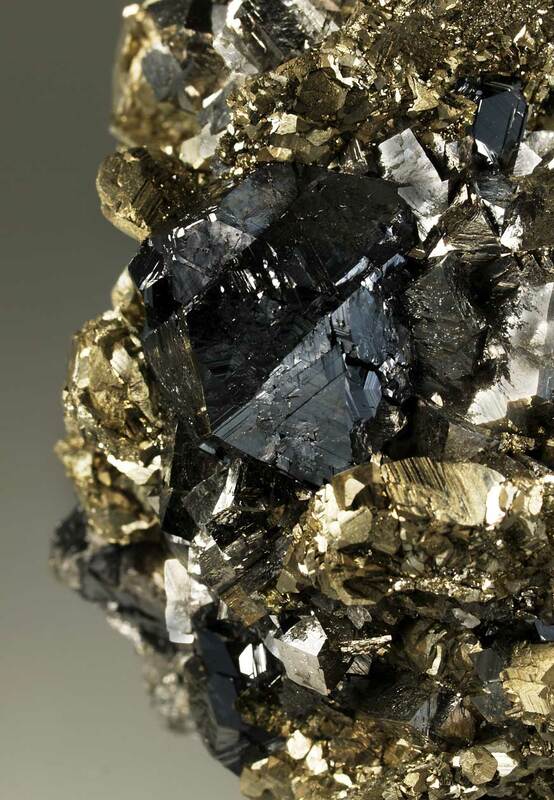 A very aesthetic, brilliant (more than in pictures) and classic European specimen. 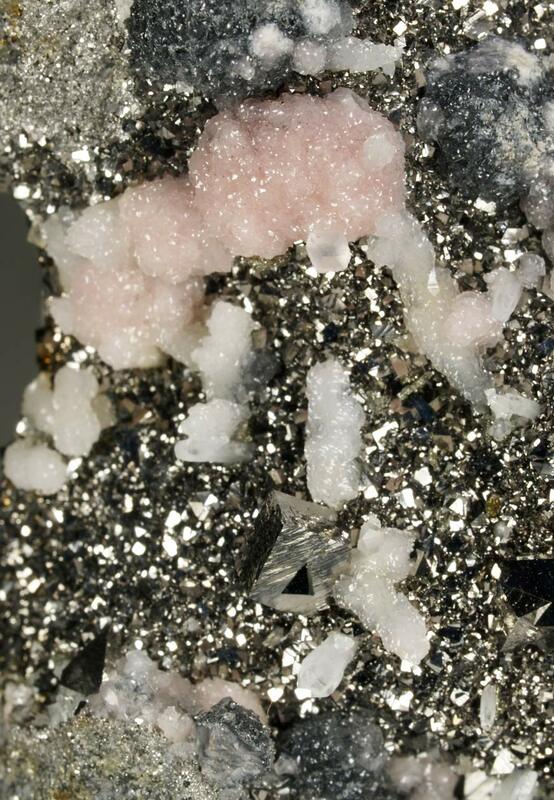 Size: 7.5 x 6.4 x 5.4 cm. 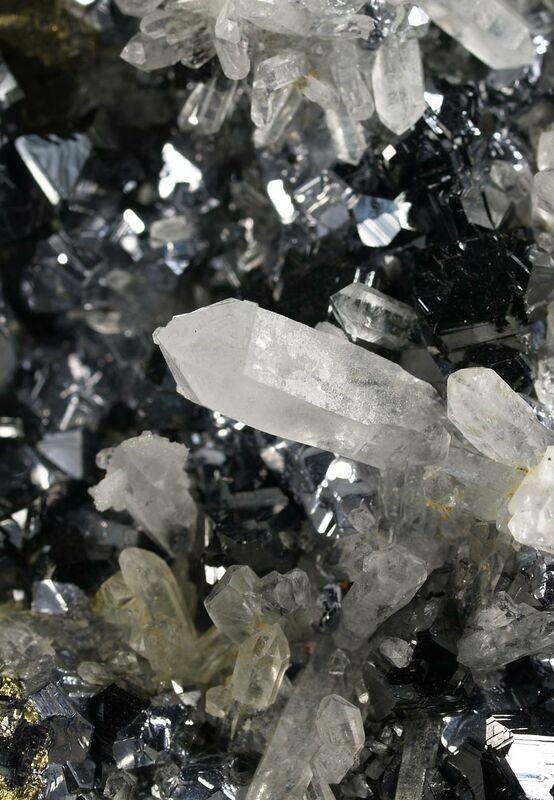 Pure brilliance, shining crystals, pure aesthetics. 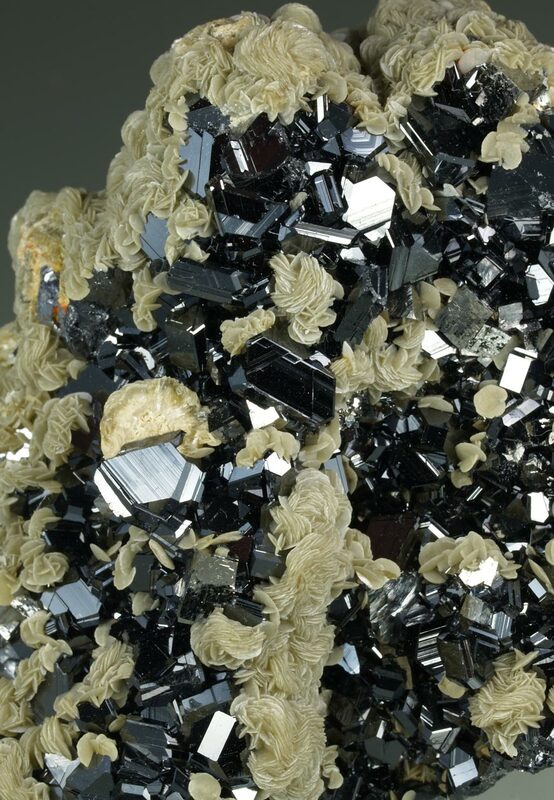 This specimen is formed by several sphalerite crystals, very, very bright, complex and of intense black color. When the light falls on them, the reflections are amazing. 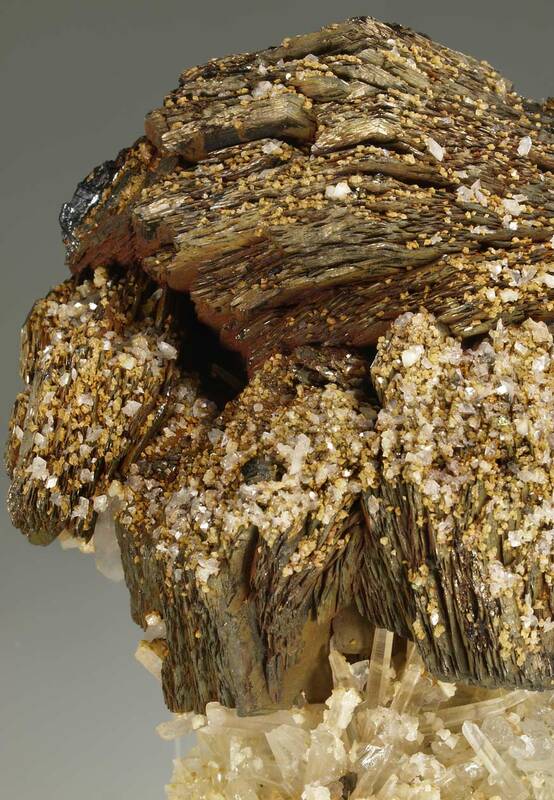 They are accompanied by lenticular siderite that gives a touch of contrast with the sphalerite. 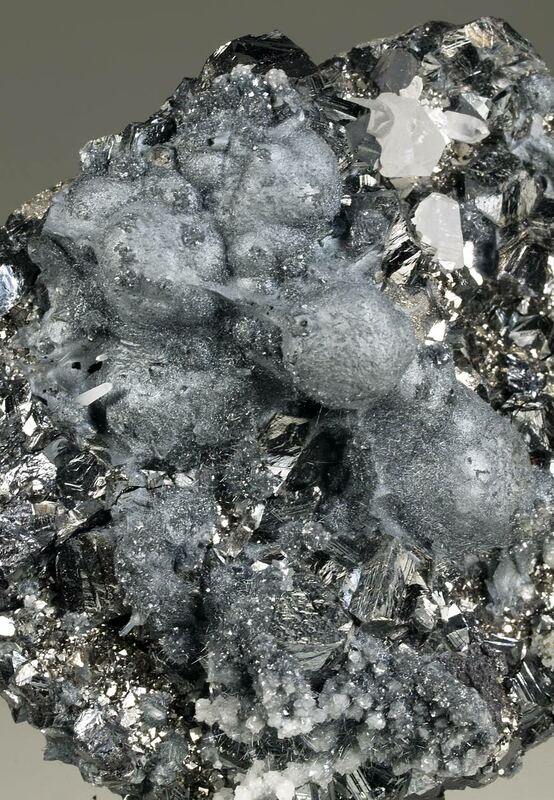 Some scattered crystals of arsenopyrite. A piece that will stand out in the showcase; turn it over with your hand hand under the light and enjoy. Size: 8 x 7.2 x 5.4 cm. 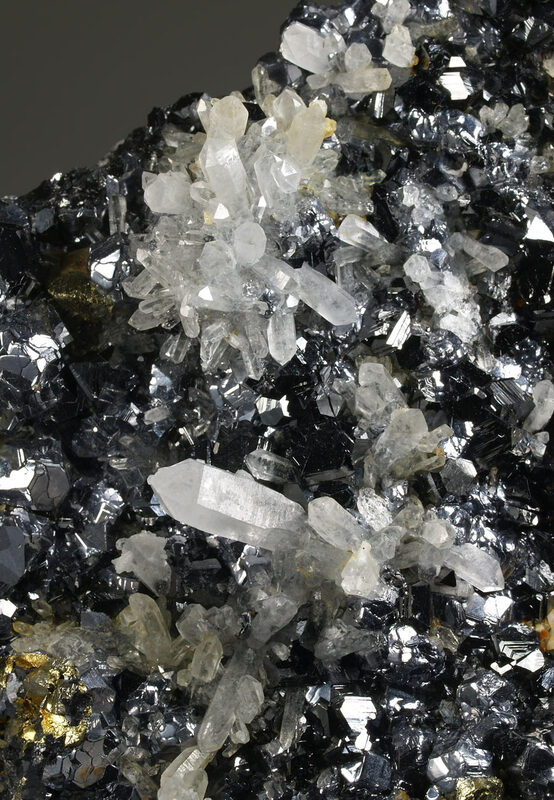 A combo that Trepča supplies to the world of mineral collecting. 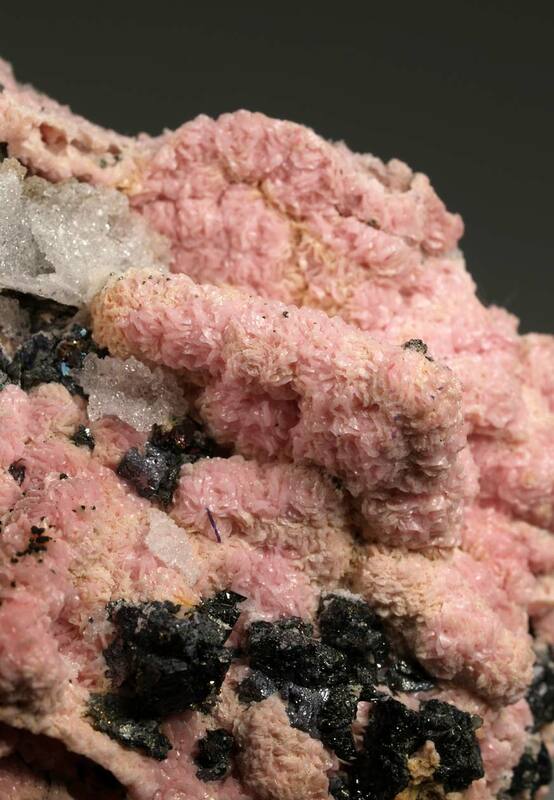 In this specimen we have rhodo crystals with pink tone, well defined. 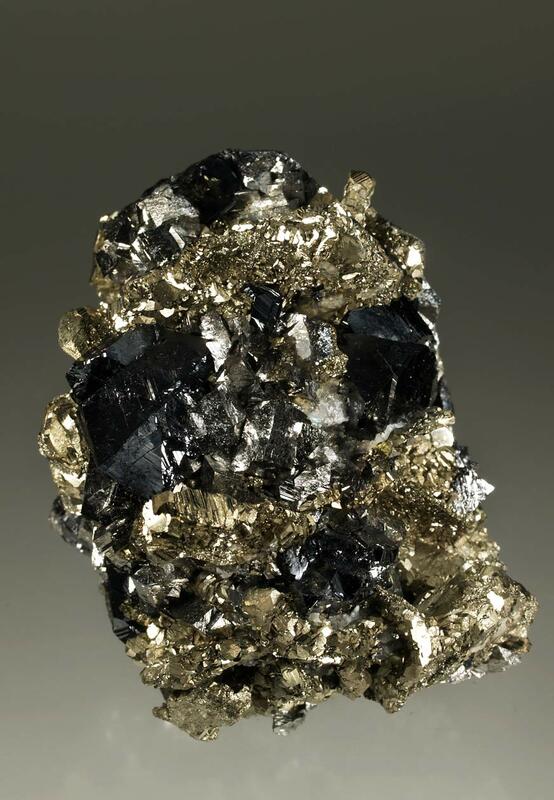 They're partially covering sphalerite crystals, of intense brightness, with defined crystals of galena. 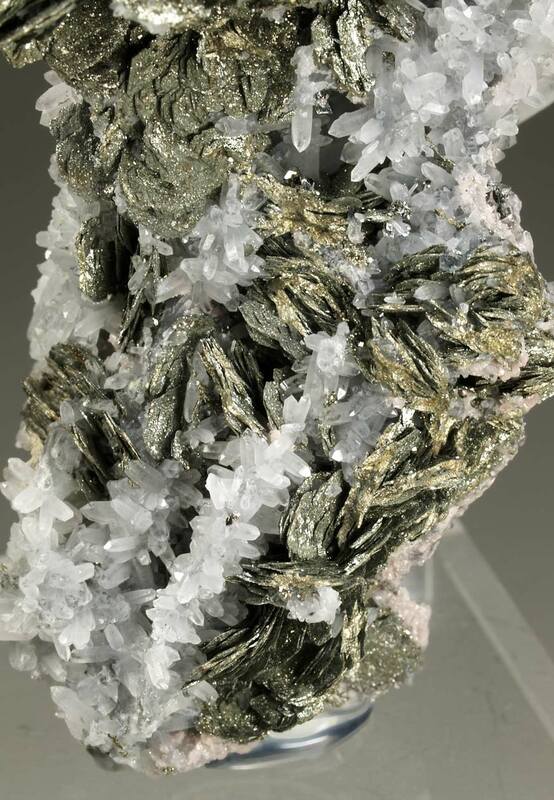 Very thin quartz crystals forming rosettes and upholstered areas of delicate boulangerite filaments. 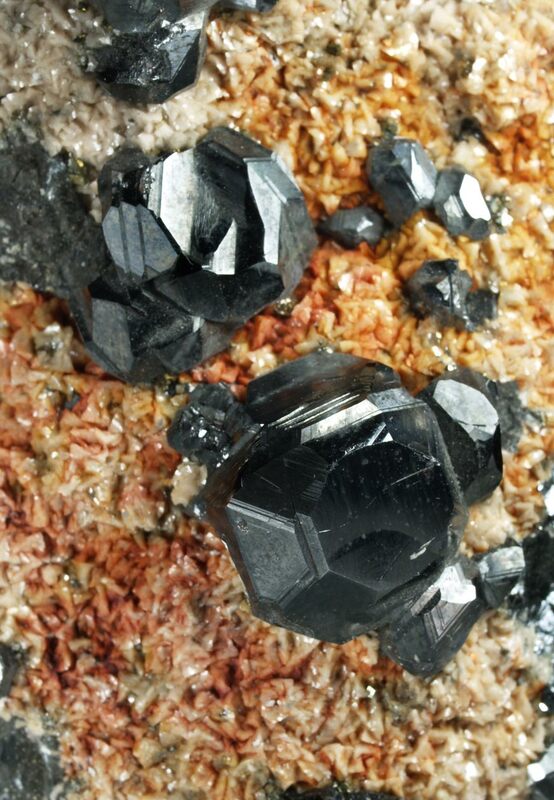 Calcite flattened rhombohedral crystals with a greyish tone. 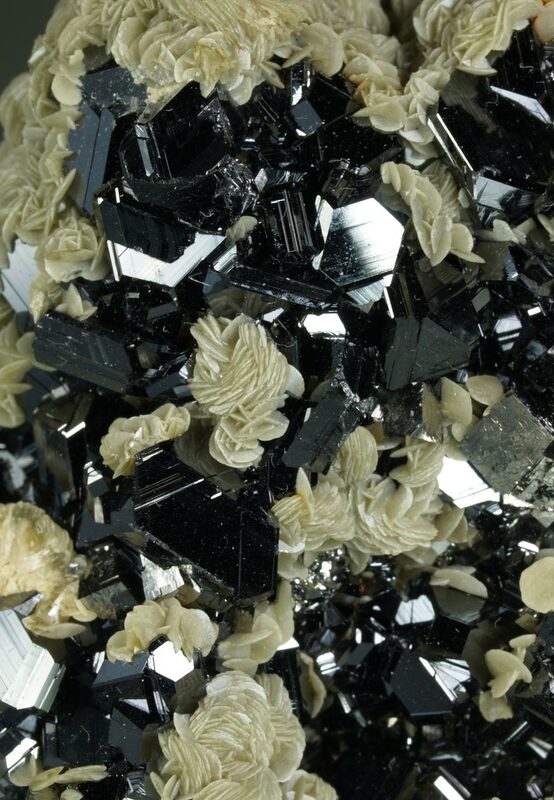 A very aesthetic and interesting sample. Size: 8.5 x 6 x 5.5 cm. 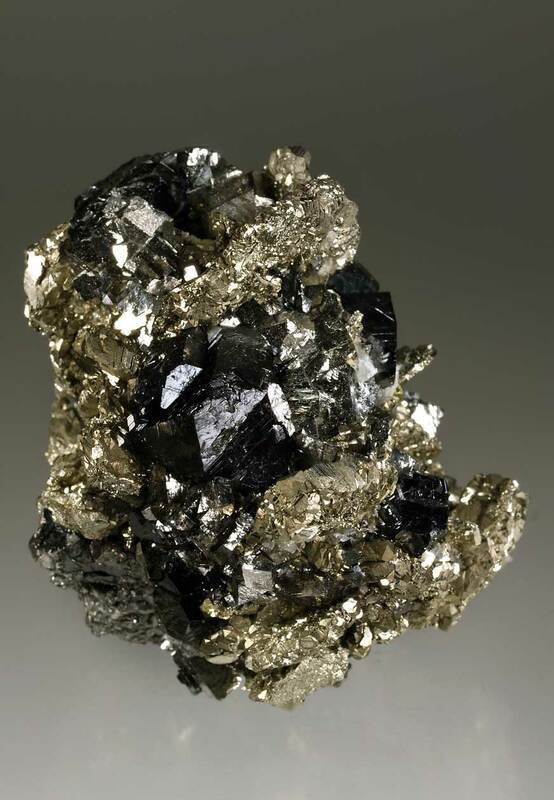 Brilliant and huge size specimen formed by numerous cube octahedron crystals of galena, accompanied by sphalerite and chalcopyrite also with high luster. 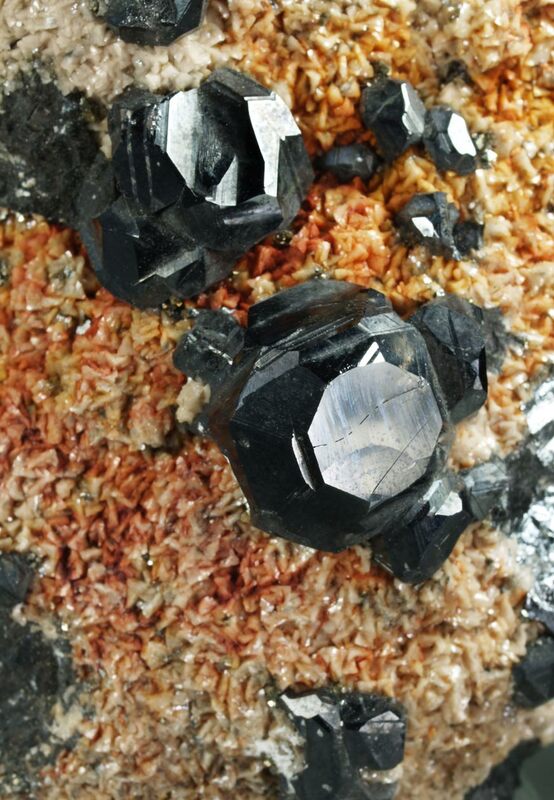 On the sulphides we can enjoy various aggregates of quartz crystals with a developed prism. Very aesthetic. Size: 13.5 x 11.0 x 5.0 cm. 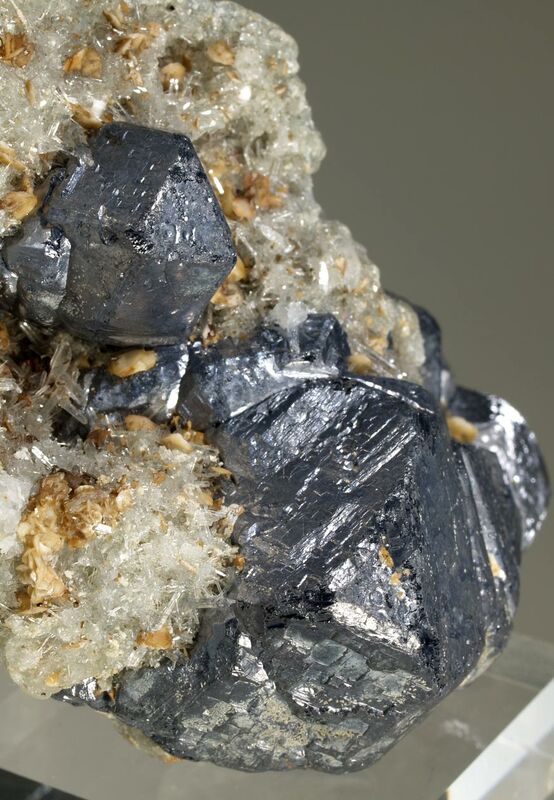 Galena specimens from this Kosovar mine are not very common. 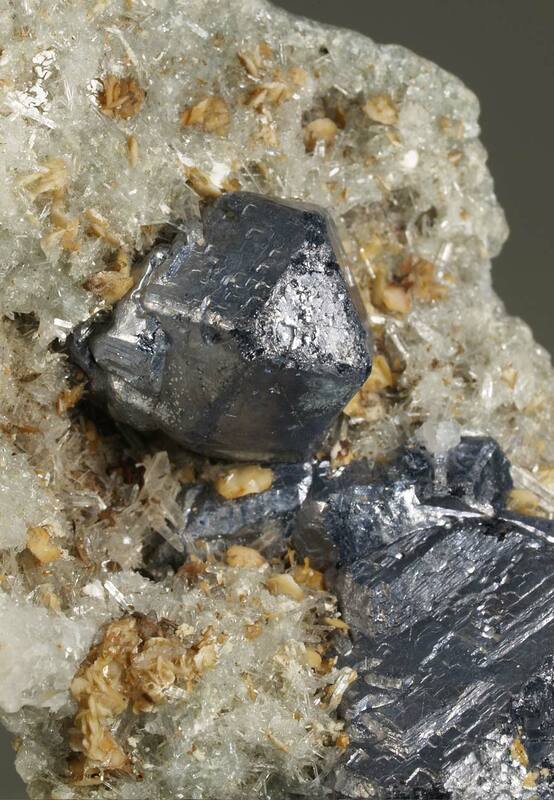 In this sample we can enjoy a brilliant group of galena crystals of good size, well defined, with faces of the cube and the octahedron. 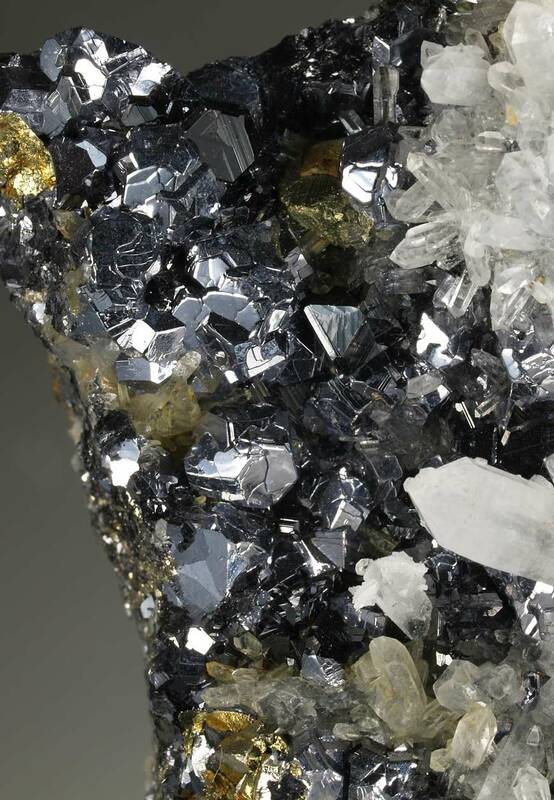 Very aesthetically disposed on a matrix with quartz crystals, lenticular siderite and pyrite. 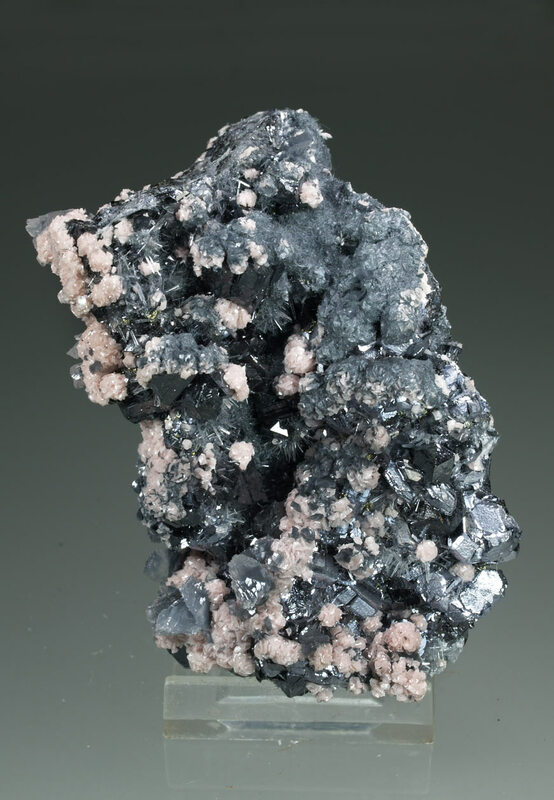 Size: 7.8 x 7.4 x 4.5 cm. 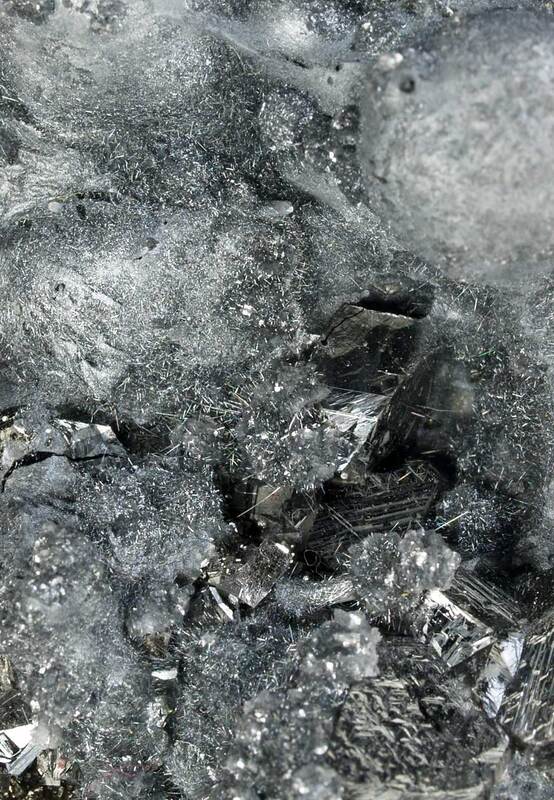 Main crystal: 20 x 18 mm. 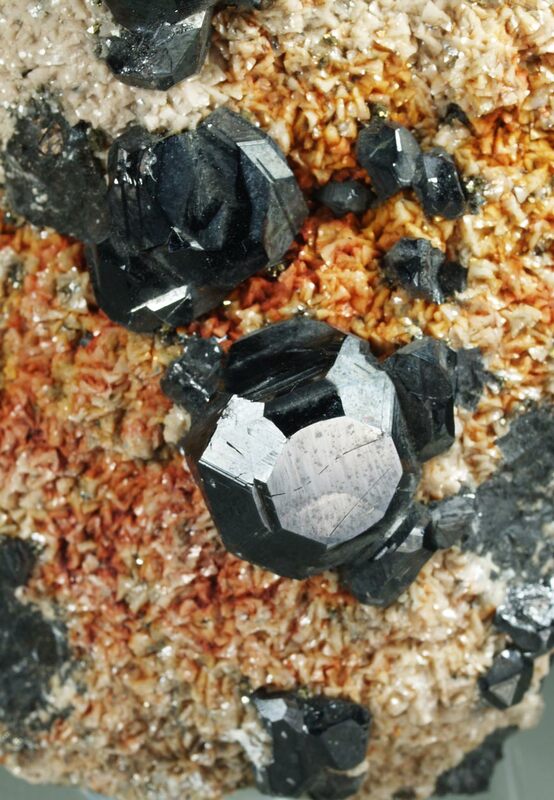 Parallel aggregate of sharp thin tabular crystals of pyrrhotite, with a hexagonal shape. 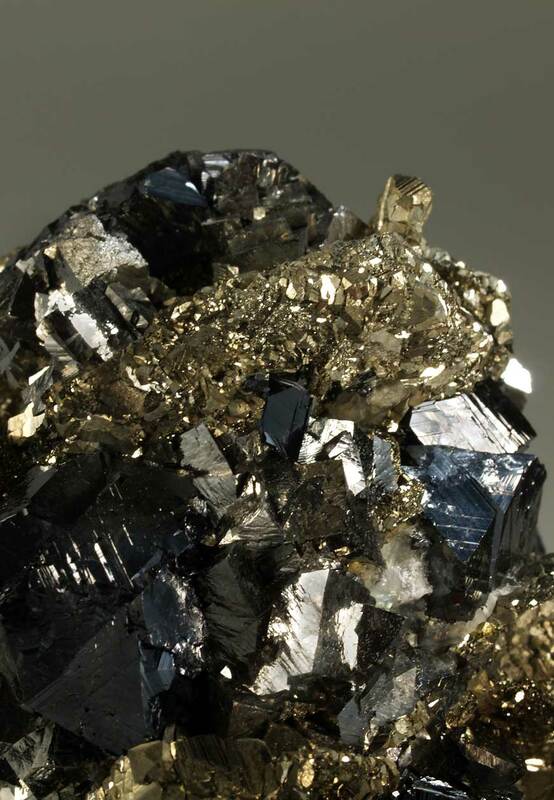 Luster and color are good. 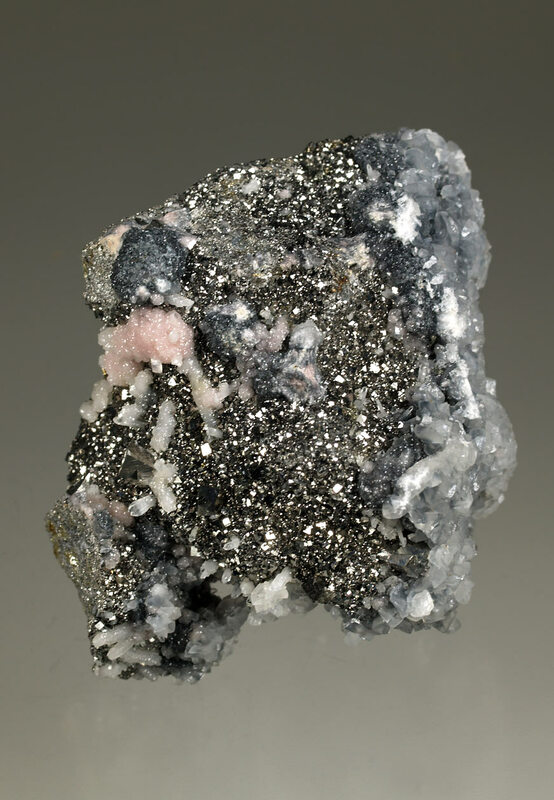 peppered by several small dolomite crystals. 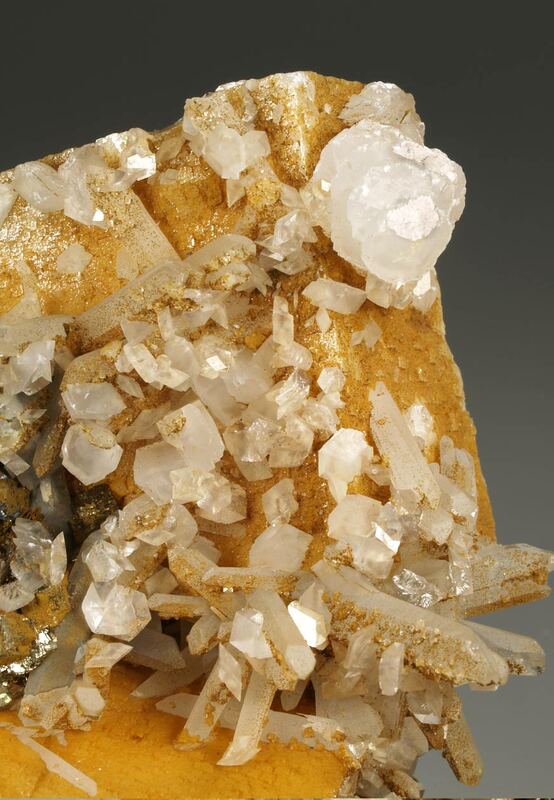 Very aerial disposed on a matrix with quartz and dolomite. Size: 11.7 x 8.3 x 4.0 cm. 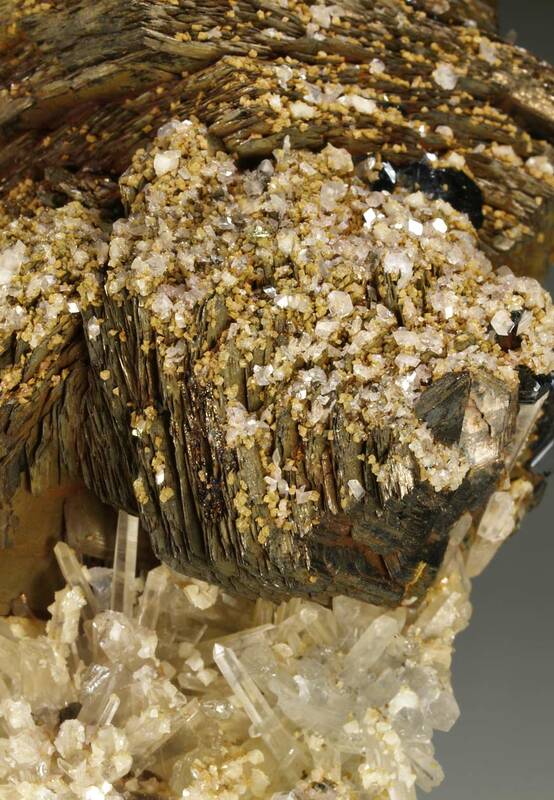 Rich group of pyrrhotite crystals forming rosettes of tabular crystals of hexagonal shape, with an exceptional brightness. 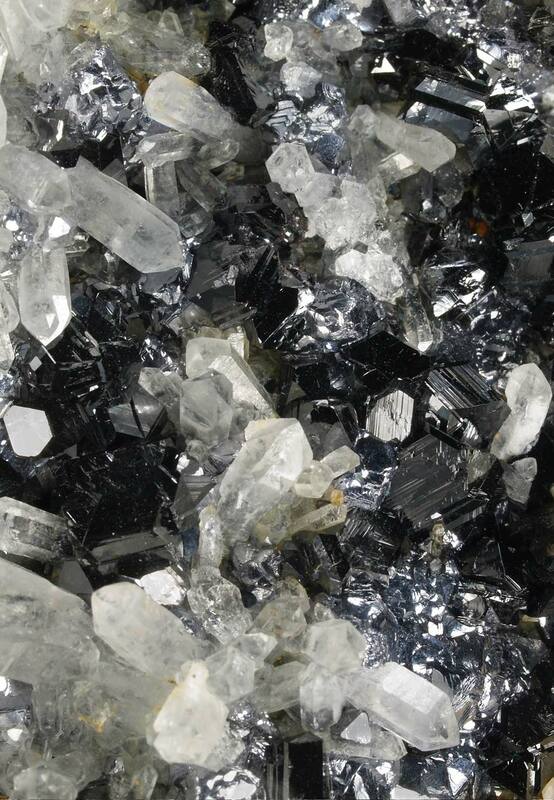 They are disposed very aerial on a matrix partially covered by quartz crystals and dolomite. 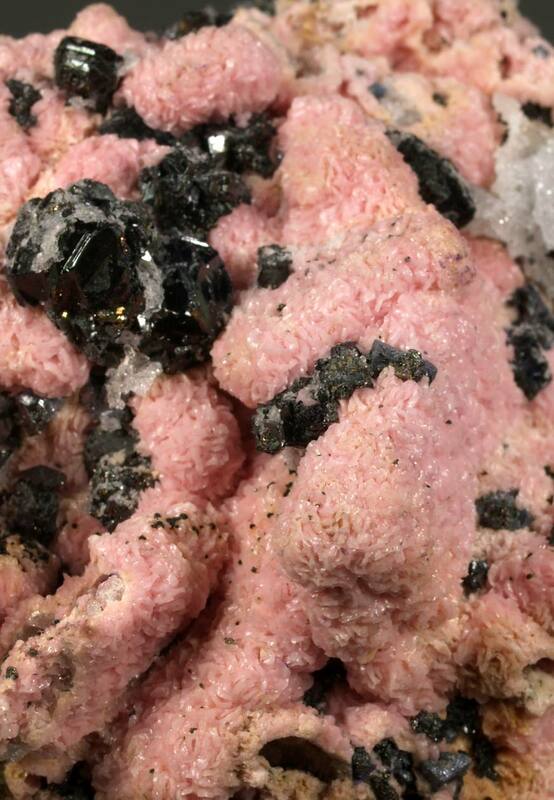 An exceptionally aesthetic sample from these classic mines. 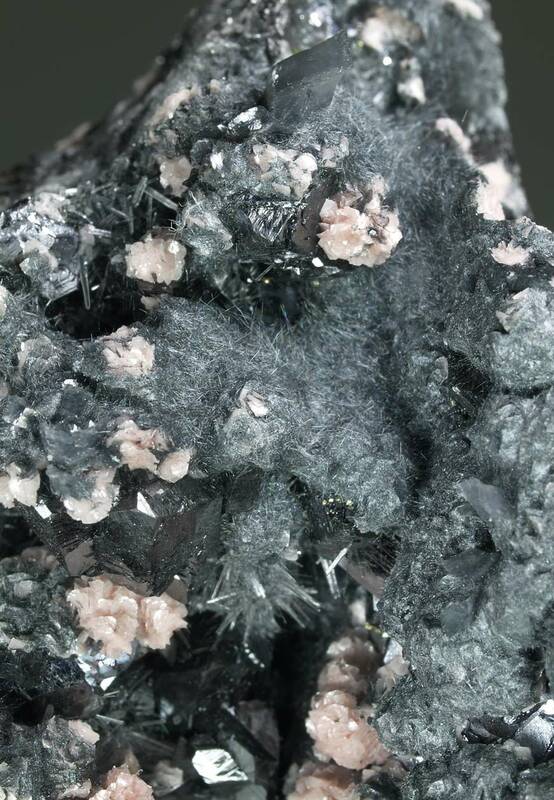 Size: 7.0 x 3.8 x 3.5 cm. 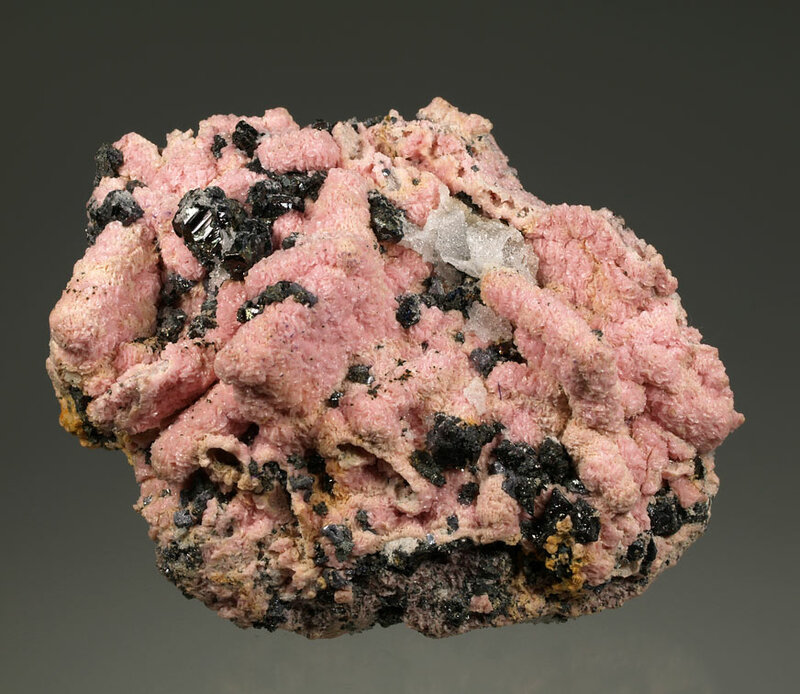 A very aesthetic specimen covered by rhodochrosite crystals, preserving the forms of barite. 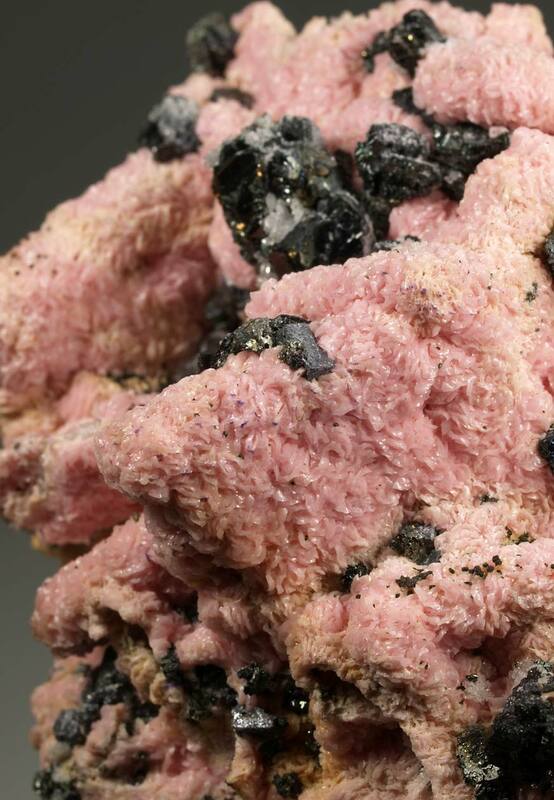 They show curved faces, with an intense pink color for the locality. 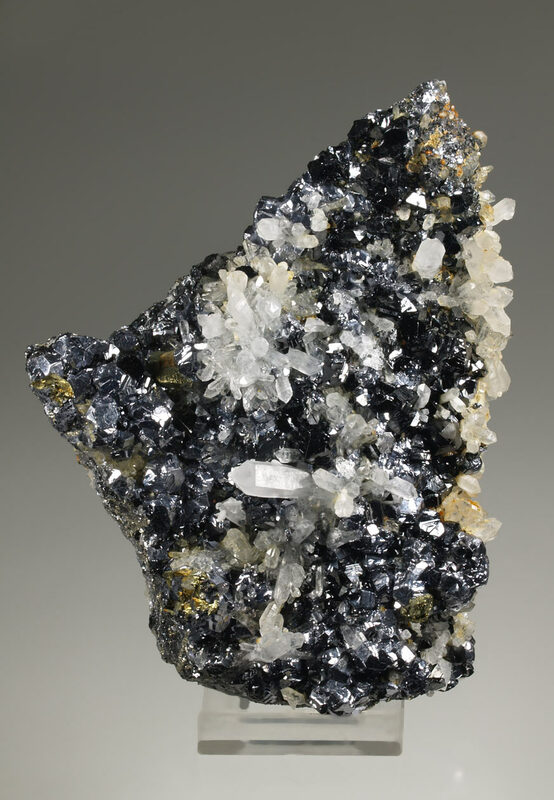 It comes with sparkling crystals of sphalerite and chalcopyrite. A classic from Trepča. Size: 10.5 x 8.5 x 5.0 cm. 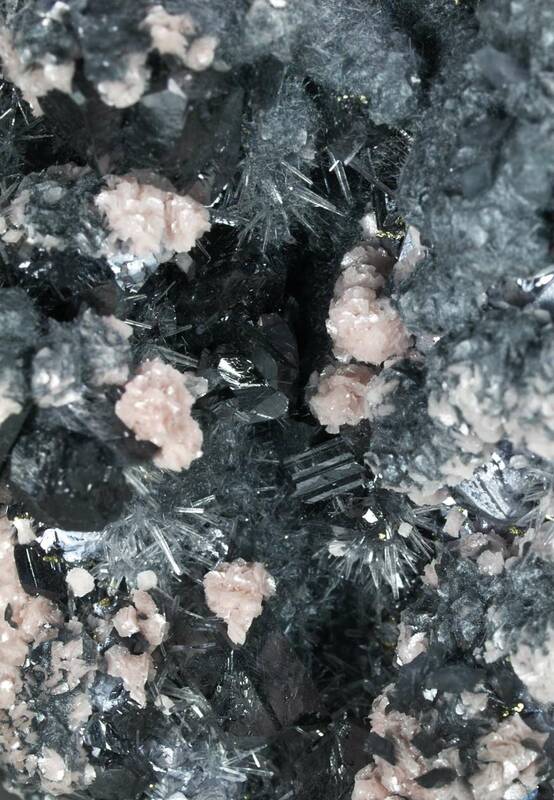 Main crystal: 25 x 15 mm.